Chanakya, the most powerful strategist of 4th Century BC, documented his ideas on management, in the Arthashastra. 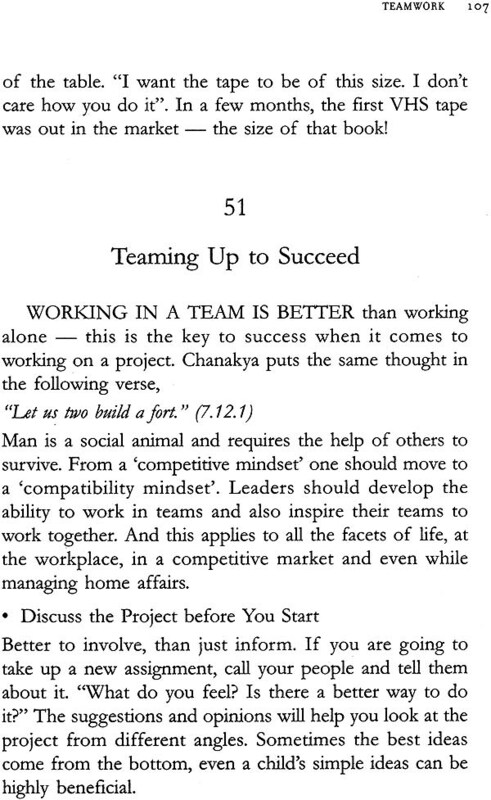 In the present book, the author simplifies these age-old formulae for success in today’s corporate world. Radhakrishnan Pillai, formally educated in management and consultancy, has an MA in Sanskrit and a doctorate in Arthashastra. He studied the ancient text, the Arthashastra, at Chinmaya International Foundation, Kerala, under the guidance of Dr. Gangadharan Nair. Director of SPM Foundation and part of the University of Mumbai team, he designs various leadership programs. He is the founder-director of Chanakya Institute of Public Leadership, Pillai is the recipient of the Sardar Patel International award 2009. Tom Alter is best known for his work in Bollywood, but has also been a theatre and television actor. He was awarded the Padma Shri in 2008. The journey of Corporate Chanakya has been encouraging beyond belief. For a debut author, writing the first book itself was a challenge. But seeing it grow into a national bestseller has been more than a dream come true! The team at Jaico did a fantastic job of publishing and distributing the book. As a leadership trainer, I have been travelling across the globe teaching at various universities, business schools, corporates and government organisations. The media consistently carried fantastic reviews for the book. It has been heartening to always see it on the 'Most Recommended' or 'Best Sellers' shelves in bookshops. Inspired by the book, Shemaroo, the entertainment company made Chanakya Speaks, an 'edutainment' film now ready for launch. It is the world's first business management film on Chanakya. During the making of the film, Shemaroo came up with the idea - an audio book on Corporate Chanakya. Tom Alter, the veteran Bollywood actor and theatre and television artist, agreed to do the voice over. I am personally thankful to him for taking the book to another level altogether. 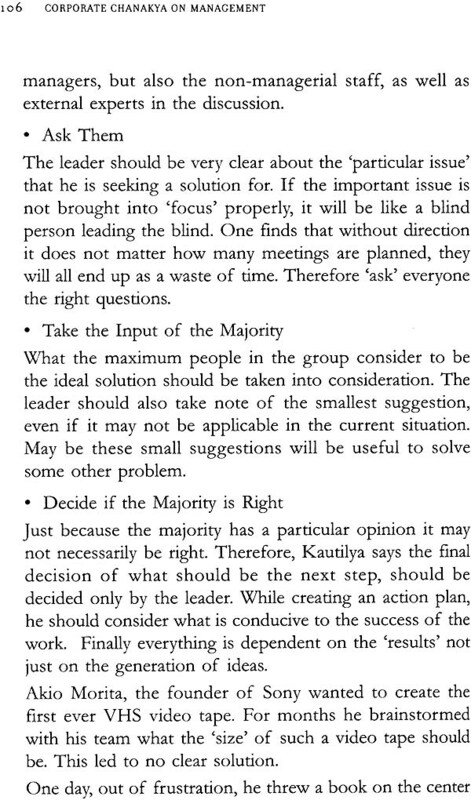 The book Corporate Chanakya had 3 sections - Leadership, Management and Training. During one of my training programmes, the Chairman of the company who was attending the program said, "Your book has 3 books within it!" I discussed the possibilities with Jaico, of bringing out Corporate Chanakyla as 3 individual books on Leadership, Management and Training. And about giving voice to each of them! the King (male gender) as the leader, the pronoun 'he' is used. Leadership and management skills are not gender- based but they are qualities which can be developed as a 'mind-set'. So, this verse is from Kautilya's Arthashastra Book 2, Chapter 9 and Verse 3. The same format has been followed in all chapters. 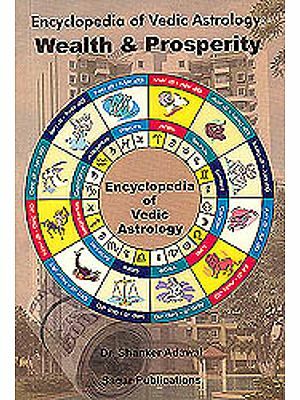 • The book that readers can refer to for the verses quoted, is the English translation of KautiIya's Arthashastra by R.P. Kangle of Mumbai University, published by Motilal Banarasidas. The explanations given are the interpretation of the author. Various other translations and commentaries of Arthashastra other than this book are available. There was once a young man in Mumbai who wanted nothing more than to succeed in the world of business. He had studied management in colleges that extolled the, virtues of the western ways of understanding this subject. Soon enough, he worked his way up the corporate ladder, but finally decided to set out on his own. After all, who wants to be bossed over by someone else? His first venture was in the realm of spiritual tourism. Since no one in his family had ever been an entrepreneur, he had to learn everything about setting up a business on his own. By the grace of God, and the support of his business partner, the business began to do well. From being a manager in someone else's company, he had become the leader of his own business. Since his childhood, he had found guidance in a spiritual organisation and had been blessed by many spiritual masters. During a spiritual discourse a Mahatma said, "India, our motherland, has great history and legacy. Our Rishis were no ordinary men - they have studied and perfected every science ill this world. Only if we were to look back into our glorious past we would find solutions to all our modern problems." This was the divine message he had been waiting for. Management has been recognised as a science since the 1950s. One of the fathers of modern management is Peter Drucker. But didn't 'management' exist in India even before the 1950s and the Drucker era? As a nation we have over 5000 years to our credit. 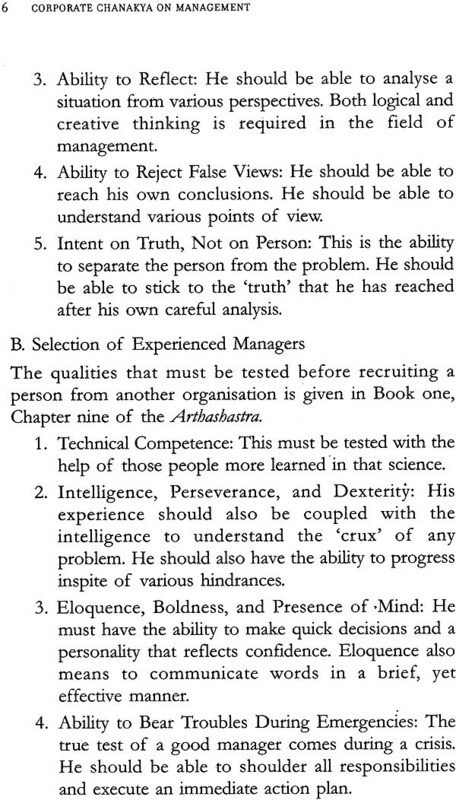 Did we not have management scientists in our country before the 20th century? In the ancient Indian scriptures - Ramayana, Mahabharata, the various Upanishads - he found brilliant discussions of management strategies. Why was it that we Indians, always look at what is wrong with India and never appreciate what is great about our country? As a nation we have survived the test of time. Even though we are still a growing economy, we are not a failed nation. In the past, our country had achieved the peak of success for thousands of years. How many nations can boast of such a heritage? He now realised that the missing piece which would help his business grow was to look 'within' rather than outside. The western principles of management are undoubtedly good, but even his own ancestors were extremely good at management. 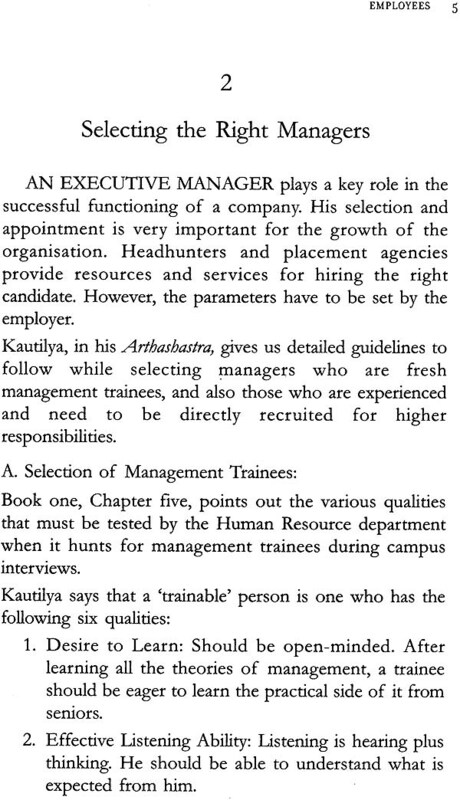 Thus, one day, while looking for Indian books on management, he stumbled upon Kautilya's Arthashastra, written by the kingmaker, Chanakya. Who has not heard about this book? Even he had. But hardly anyone from his generation had studied it. He bought a copy. A few pages into the book, he was upset! He could not understand anything! He read the pages over and over again, but the message of the book was out of reach. The subject itself seemed dry and boring. He felt the author had made everything seem more complicated than necessary. He said to one of his mentors, "I do not understand anything in the Arthashastra, even though I am trying my best to learn from it." His mentor told him, "In India, we consider the scriptures to be mirrors. They reflect who you are. So if you do not understand Arthashastra, do not blame the mirror. As you grow and experience life, you will understand the book better." That year, he went on a pilgrimage to Kailash Mansarovar, the holy abode of Lord Shiva. One evening, a voice seemed to speak to him, 'Make Kautilya's Arthashastra your lifelong pursuit. Don't just study it, but apply it in your life. 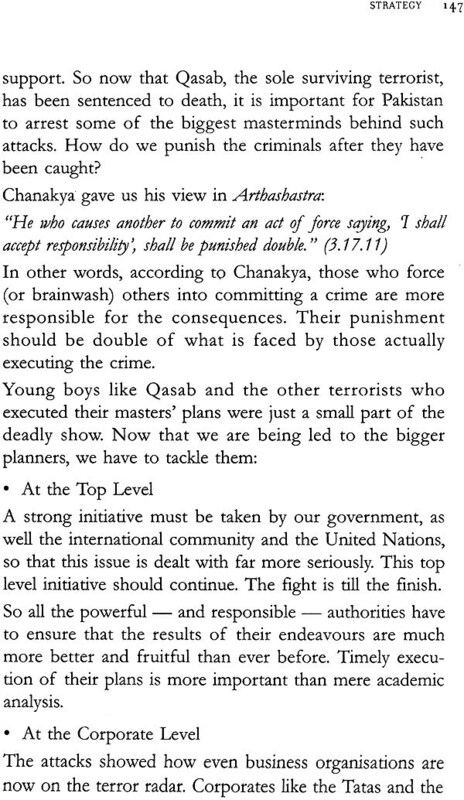 Live the Arthashastra!' He could not believe that he was listening to his own thoughts, this had to be divine intervention! He had heard about an ashram in Kerala, dedicated to the research of ancient Indian scriptures. He declared to the Acharya (teacher) in charge of the ashram, "I want to study the Arthashastra." The Acharya was happy to see the young man's interest, but said, "You will have to come here and learn it under the Guru-Shishya Parampara." This meant taking a break from the business and staying in the ashram and studying under a Sanskrit scholar. This was not an easy decision for a businessman from Mumbai. But, with the help of his partner, he took time off from the business, and studied the wisdom of the Rishis. The time he spent in the ashram changed his life forever. With a deeper knowledge of management he now returned to his urban life to apply what he had learned. Immediately, he experienced success! His business grew and people were impressed with his new skills. When they asked him how he had achieved success, he said, "Two things helped me - the grace of my Guru and the knowledge of Kautilya's Arthashastra." 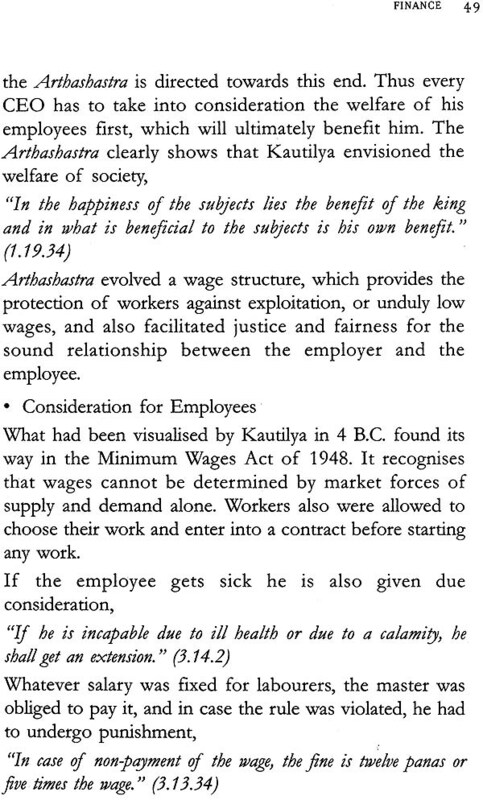 After I returned from Kerala I applied Kautilya's practical and perfect theories to my own business. Even though Atma Darshan brought me success, something else began to happen. My friends from the corporate world urged me to share this knowledge I had gained. I was invited to speak at various seminars, conferences, and training programmes in India and all over the world. Businessmen consulted me on several matters. Well- known publishing houses and newspapers asked me to write about how Kautilya's wisdom could be applied to modern businesses. I was also asked to host a radio show. I met so many people who are interested in Indian management and Indian wisdom. Despite the differences between them with regard to age, nationalities, designations, and industries, all those who participated in my workshops and chose to attend my seminars felt a deep respect for Chanakya's genius. And then came the support of the SPM Group of companies which allowed me to delve deeper into Arthashastra. I am now fully devoted to the cause of the promotion and application of Indian management ideas. Today, I am the Director of the SPM Foundation which aims to 'make India strong and self-sufficient' in the ancient Guru-Sishya Parampara method. 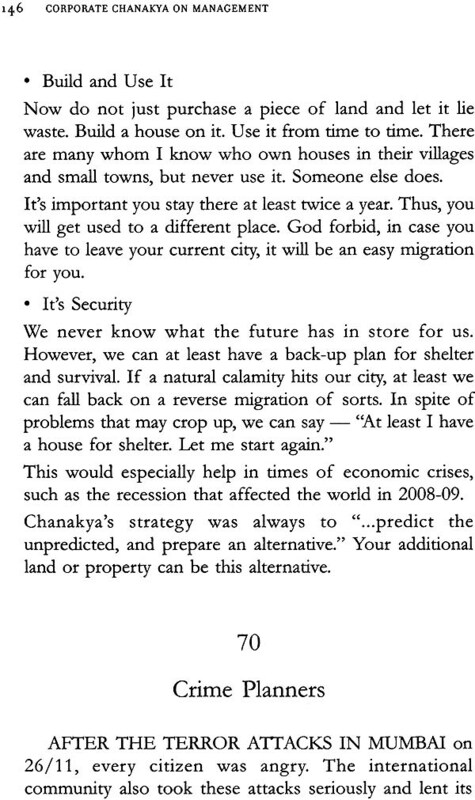 This book is a documentation of all my ideas that I have shared with millions of people from the corporate world, all across the globe, about how to apply Chanakya's practical solutions to solve day-to-day problems in modern businesses. 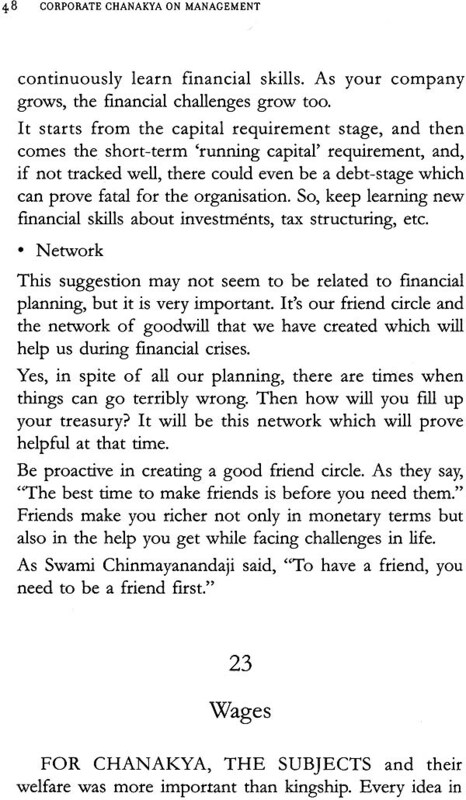 Corporate Chanakya on Management is not just about me. It's about you and everyone else who wants to practise the principles of Indian Management in their work and wants to be successful.